Editor’s Note: It’s impossible for anyone driving toward the northern tip of the Door Peninsula, not to be momentarily swept away by the view from the top of the Ellison Bay hill. The Grand View (the million dollar view), call it what you will. Prime real estate for sure. There was always a fear that someday this would be lost to development. And what a tragic loss that would be. Given man’s insatiable greed, what, if anything, could be done about it? On Saturday, June 23, 2012, I was invited by the Door County Land Trust to speak, in celebration, of the fact that this, now, would never happen. This “grand view” had been secured forever, thanks to common sense—or call it ‘spirit’. 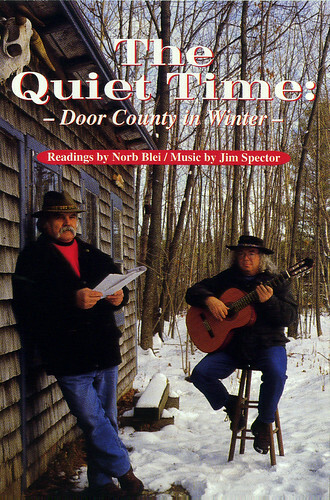 Thanks to so many locals, outsiders, groups, government agencies, who did the really hard work, spread the word, found the money, attended all the meetings, aroused the interests of those in power who could make the connections, make things happen, especially the Door County Land Trust, a guiding light in this county for certain. So today, this moment, for this “Grand View” before us, we say “Thank You” to all who worked long and hard to bestow this gift upon us—individuals, various businesses and groups…the historical society, the state, the county, the town board—people like Frank Forkert, Bob Davis, John Lowry, Beth Coleman, Stefie Burke… And above all, the Door County Land Trust–its members, it’s entire board who put in so much time and effort to see that this “Grand View” was secured “Forever” for all of us: Tim Stone, Terrie Cooper, Dave Callsen, Dan Burke, among them. THANK YOU all. But what do we do about man’s continual pursuit of land both necessary to our country’s development yet troublesome, given the nature of man’s greed in our time? The majority of Western man is now urban and soon the whole world, over half of us, will be living in towns and cities. Imagine this very setting cluttered with condos, shops, gated communities. What would we have gained—lost? What is it about man’s chronic need to profit from nature’s gifts? When Nature’s only purpose is being and surviving? So we express our appreciation again for this gift. What else can we say but, “THANK YOU” as we gather here today to celebrate the Nature of History and the History of Nature—past, present, future. And that we honor the place of History in our lives. When I come upon this “Grand View” almost every day (over 40 years now) I can’t help but think what a sense of earth, sky, air, water, horizon, wilderness caught the eyes of our first settlers…what our Native Americans embraced, made of this in their daily lives through silence, dreams, art, healing ceremonies, chants that mirrored the very sounds of nature. Spirit speaks in image. You cannot take in “the Grand View” without it silently taking you into it. Define “IT” however you like. Its presence cannot be denied. John Muir believed that every natural object is a conductor of divinity. There is a divine presence in everything. Go for a walk. Say that Winnebago prayer of reverence for the earth. Should an animal, plant, rock, or ‘grand view” draw your attention, stop and silently offer thanks for the joy and beauty you feel. Does “pure nature” have any other purpose but to serve us? What to do? To come to terms with man’s appetite for land values and the real value of land being nothing more than what it is. Open. Wild. Free. Another great American preservationist (who once passed through Wisconsin, late in life, on his way to Minnesota)…Henry David Thoreau, concluded that wilderness for the sake of wilderness was a good thing to have around. In the 1850’s he proposed that every town in Massachusetts save a 500-acre piece of woods which would be forever wild. But it never happened. He was never listened to. “This is what you shall do: love the earth and sun and animals…” wrote our great American writer, Walt Whitman. “The idea of wilderness needs no defense, it only needs defenders…Wilderness is not a luxury but a necessity of the human spirit,” wrote another great American writer, defender of the desert Southwest, Ed Abbey. More history: Behind me, across this very same “Grand View,” just over my shoulder, on that far cliff sits a very unique school, a place called The Clearing, founded by Jens Jensen, a landscape architect, in 1935 at the age of 75. His gift—of nature, of education, of solace and self-renewal to all of us. One wonders what Jensen must have seen and felt when he approached this “Grand View” over 75 years ago? Trust the Land Trust and all those individuals, town boards, organizations who seek to preserve the many gifts nature has bestowed upon us—for our own good. 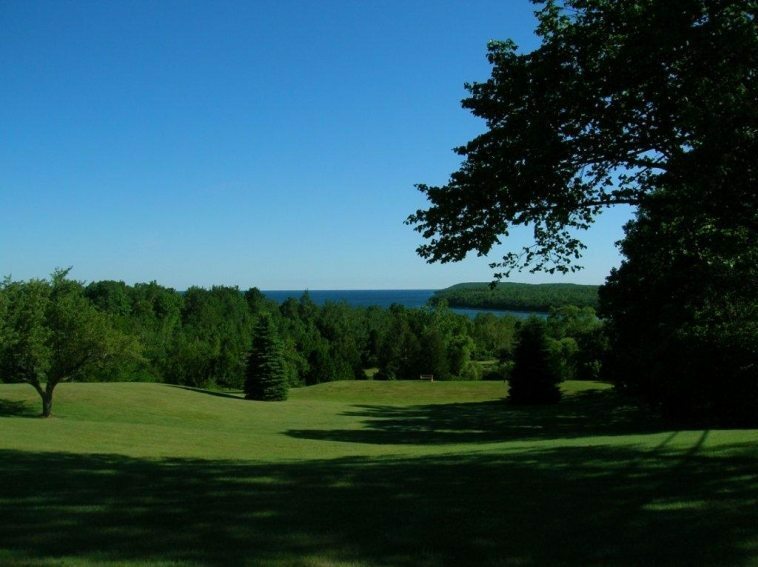 Trust the historical and natural presence of this “Grand View” which we honor ‘forever’ today, the 46th anniversary of ‘Olde Ellison Bay Days”…our continuing history in the making. Trust what you know in your heart to be both and an obligation and a gift, the great and grander view of all the natural wonder and beauty this county alone possesses—a promise kept…to be passed on to all who will come after us. Wish I’d been there to see/hear it! Loved all your excerpts, (including Blei, of course) I was particularly struck by the piece by Jensen – embarrassed to say I wasn’t familiar with it, and it justified my respect for his vision and all he stood for. Thank you for sending this. It truly is a grand view. I marvel at it every time I am privieged to see it – which is not often since I live in Illinois. I love to stop, get out of the car and breathe it all in. The Land Trust is to be commended for saving this gift for the future. That’s the Door County I saw the first time I visited over 40 years ago. Deeply moved once again, as we were at The Grand View Saturday afternoon. Thank you Norb for accepting our invitation to speak. Your thoughts in words captivated the audience. haven’t had the privilege of actually seeing this “grand view” but it is something I now do look forward to seeing. . Thank you Norb for honoring all of us by your presence and presentation at Saturday’s Grand View dedication. Your words were powerful, generous and humble. No one could have been better suited for the occasion. You said it all!